Mark and Suzy Jamieson and their family paid a visit to Daphne Monday and brought boxes of supplies for Guyana. Mark preaches for the East Side church of Christ in Columbia, Tennessee and has just returned from teaching at Guyana Christian University. After his report to the congregation they heartily joined together to provide books for the students at the school and songbooks for the Parashara church of Christ in Guyana. We will be shipping their supplies on the next container. I am also excited that Mark is offering to continue teaching in the school, assist with developing the curriculum and with recruiting teachers. I first met Mark when he was at the Pleasure Island church of Christ. He is sound, dedicated and energetic. I am glad to have his assistance. 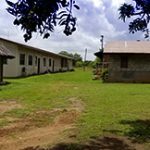 Please keep the Guyana Christian University in your prayers.